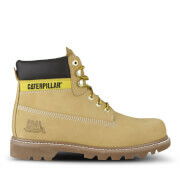 Men’s tan waterproof leather boots from Caterpillar. 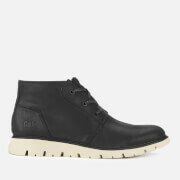 Crafted with full grain leather uppers, the ‘Sire’ boots are seam sealed to keep water out and your feet feeling dry. 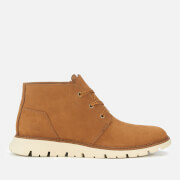 The boots are detailed with a padded ankle collar, gold-tone D-ring eyelets and lace hooks for a secure fit. Set on a lightweight EASE midsole for shock absorption, the boots have a rugged rubber sole with a textured outsole for added traction and cemented construction for durability. Complete with a breathable microfiber mesh lining to keep feet feeling fresh, heel pull loops and signature branding to the heel and tongue. Upper: Leather. Midsole: EASE Foam. Sole: Rubber.